Eva Longoria Splits from Husband | Teefa Says..
After 3 years of marriage, Desperate Housewives hottie, Eva Longoria, filed a divorce from her hunky athlete husband, Tony Parker. The reason? Tony cheats on her. Bermain kayu tiga dengan ex-teammate dier punya wife. Reportedly, the affair has been going on for a year. Haishh.. First Tiger Wood, now Tony Parker. Perempuan secantik, se-gorgeous Eva pon ditipu oleh hubby, apatah lagi perempuan kebanyakan macam diriku ini. Nauzubillah minzalik. i gotta say, Eva is my favorite Desperate Housewife. She's petite, she's slim, she's skinny, rich, has a great husband (dalam cter tu).. Memang lah feveret kan? Sayangnya realiti tak seindah drama di TV. 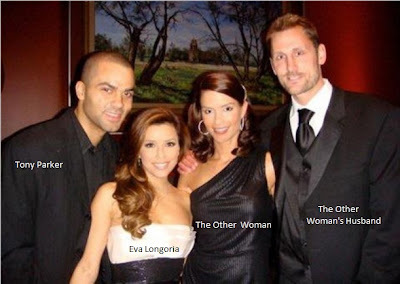 Tony cheats on Eva with his ex-teammate's wife. Backstabber alert!